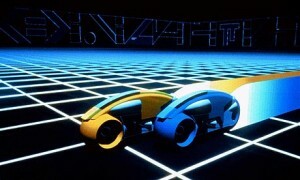 Tron is a Disney film from 1982 written and directed by Steven Lisberger. 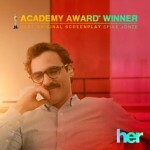 The movie could best be described as an eighties science fiction adventure for teenagers. 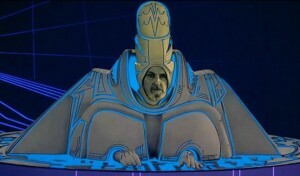 The Academy disqualified the film for the Oscar for Best Special Effects, because computer animation was considered cheating at the time. 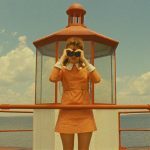 It did however receive Academy Award nominations for Best Sound and Best Costume Design. The storyline is not exactly the most important part of the movie and is subordinate to the computer graphics and the sound effects. 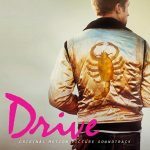 Kevin Flynn (a young Jeff Bridges resembling Eddie Vedder) is a computer hacker who runs an arcade hall at day and tries to hack into the system of his old employer Encom at night. Dillinger became wealthy by stealing credit for Flynn’s work. The reason is Encom’s Vice President Ed Dillinger (David Warner) took credit for several video games Flynn wrote. This includes the very successful Space Paranoids but also games with great names like Matrix Blaster and Vice Squad. When Dillinger finds out Flynn is trying to get into the system he disallows access to everyone with Group 7 access. Encom employee Alan (Bruce Boxleitner) is not quite amused when his permission is denied and explains the situation to his colleague and girlfriend Lora (Cindy Morgan). They decide to warn Flynn, who used to date Lora, that Dillinger is on to him and they sneak into Emcom. 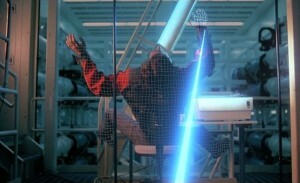 When Flynn tries to hack his way into Dillinger’s Master Control Program, the MCP uses Lora’s experimental laser to blast him into cyberspace. 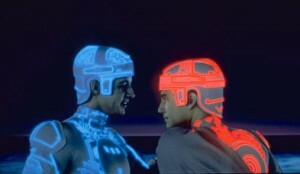 In this computerworld called the Grid, Flynn lives among different programs who look like humans in funny neon suits. Apparently Jeff Bridges had to wear a belt to conceal his junk in this tight computer outfit. 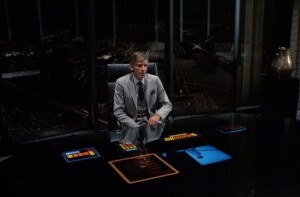 When Flynn arrives in the Grid, he is ordered to fight other programs by throwing disks in an arena. The winner finally has to destroy the other player, an act which Flynn bravely refuses to do just a Russell Crowe refuses to kill his opponent in Gladiator. In this cyberworld there are good and bad programs, easily recognisable by their blue and red suits. Each program seems to have a user controlling them from the real world, a cool idea later used in The Matrix. Flynn happens to meet Tron and Yori, the alter egos of Alan and Lora who of course do not recognize our hero. 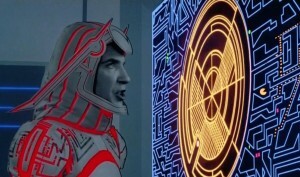 Upon explaining his mission and the fact he is a so called user, Flynn teams up with Tron and Yori to restore freedom in the computer world by destroying the MCP, just like you have to fight the end boss in a video game. During their journey they lose Tron, so Yori as any good widow would do, kisses Flynn without any hesitation. 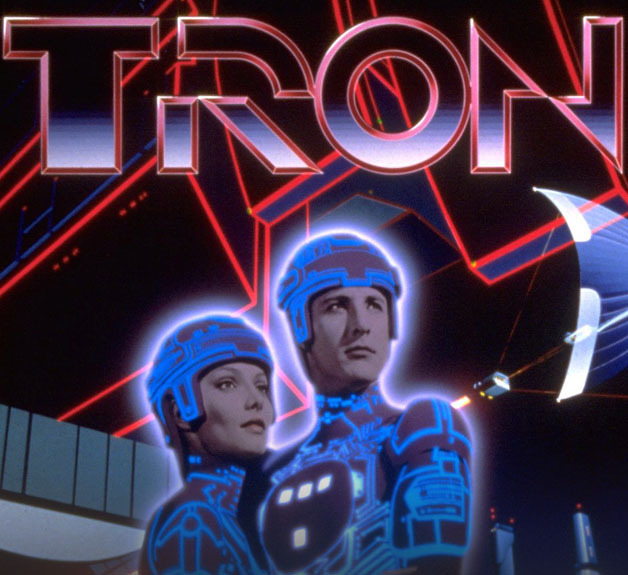 When the computer world is saved however, Tron resurrects and Yori has no trouble in getting back together with him, pretending nothing happened. Rumour has it, actress Cindy Morgan traded her Yori costume for a Lexus after shooting this film. After the MCP is killed, the director decides to finish the movie in no time! In five minutes time, Flynn is transported back to the real world and finds a note on a typewriter (in a 1982 science fiction movie!) which confirms he holds the copyright of Space Paranoids. In the end we see him arriving by helicopter on the rooftop of Encom, wearing a suit and suggesting he is the new VP of the company. As a Koyaanisqatsi like image of the roads in the city fade out, the movie is over. The movie was a huge risk for Disney and it didn’t do well at the box office. The arcade game based on the movie however earned them much more money. Disney decided not to make movies with real actors for a while and to stick to animation. 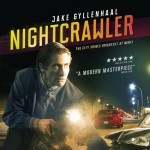 We never heard from director Steven Lisberger again. 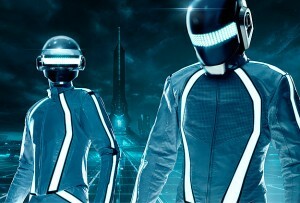 In 2010, a sequel TRON: Legacy was released which features a soundtrack by French electronic duo Daft Punk.